Clean Technica reports that Germany set a new record for electricity generation from solar panels yesterday. The post based it's report on "SMA Solar Technology’s live solar power output tool for the country." I’m sure an official number still needs to be confirmed, but a full 0.5 GW increase according to SMA’s site makes for a very safe conclusion that we have a new record. It is an estimate based on the output of thousands of SMA solar power systems spread across the country. It begs the question: What is the record in Ontario and when was it set? There is no reporting on the level of solar production, or the cost of that production to Ontario's ratepayers. The Ontario Power Authority (OPA) reported 645.2 MW of solar capacity for the fourth quarter of 2012, but by the next quarterly report the figure had leapt up to 764MW. So I'm sure Ontario must have set some records recently. We simply have no reports to indicate when or how much. If 764MW of solar panel capacity produced at an annual capacity factor of 15%, and the average contract offered $500/MWh, production would be ~1% of Ontario's demand (with 1.4TWh) and be responsible for ~6.5% of the costs ($711 million out of ~$11 billion). Production would not be distributed equally throughout the year. 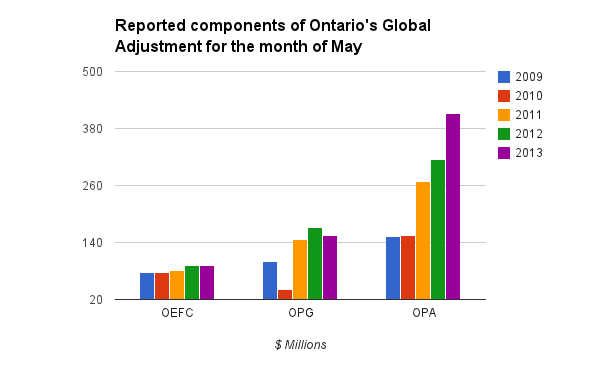 I suspect the most productive months are the months of April-June.when Ontario's hydroelectric generators are most productive and demand is light; therefore I am not surprised that May set a record for wholesale market rates in Ontario (I am surprised estimates for June indicate it will shatter May's record highs). Until there is reporting on solar production in Ontario, within a coherent, timely, accounting of the costs comprising the global adjustment, Ontario's ratepayers should assume the greatest share of the cost increases are due to solar generation, simply because it's the least transparently reported. The price, according to the European Energy Exchange, dropped below 10 euros/MWh during the hour, on it's way to ~5 euros/MWh between 2 and 3 pm.